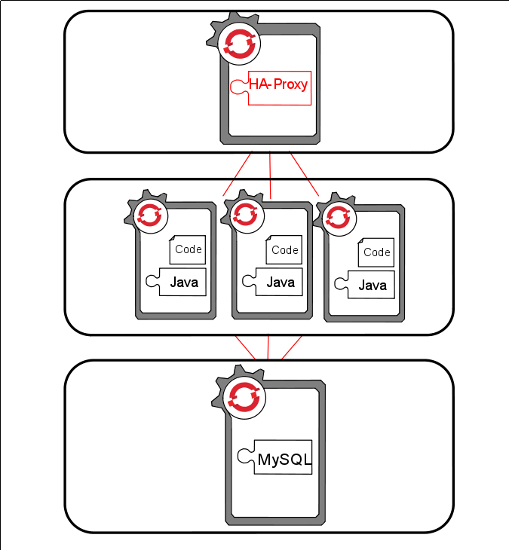 This post would describe how we deploy a Yii application into Openshift Origin. It should also work in Openshift Enterprise and Openshift online. PHP-based application that runs in a Gear must not write to the application directory, because it is not writable. Openshift provides a Data Directory for each gear, which we could use for the purpose of writing assets and application runtime log. For the case of load-balanced application, error messages written to application log is also stored in multiple gears, making troubleshooting more complex than it is. Use deploy action hook in order to create directories in the data directory and symbolic links to the application. Change the deploy script to be executable, in Windows systems without TortoiseGit we need to do some git magic. Create this file as .openshift/action_hooks/deploy in the application source code. Openshift Origin is a Platform as a Service software platform which enables us to horizontally scale applications and also manage multiple applications in one cluster. 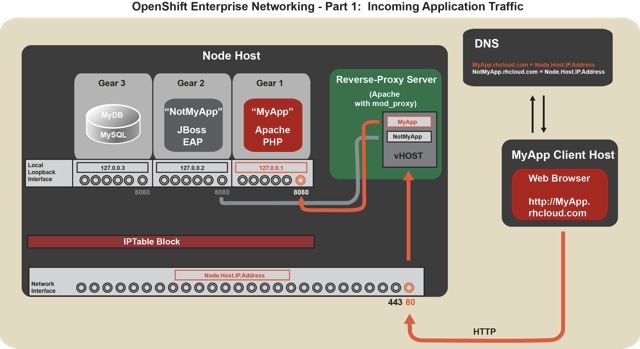 One openshift node could contain many applications, the default settings allows for 100 gears (which could be 100 different applications or may be only 4 applications each with 25 gears). Each gear contains a separate apache instance. This post would describe adjustments that I have done on an Openshift M4 cluster that are deployed using the definitive guide. Maybe I really should upgrade the cluster to newer version, but we are currently running production load in this cluster. Load balancing in an Openshift application is done by haproxy. 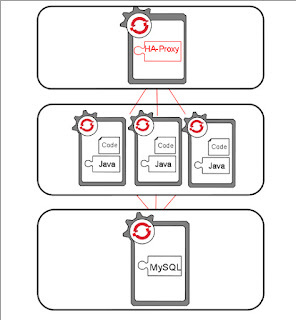 The general application architecture is shown below (replace Java with PHP for cases of PHP-based application) (ref : Openshift Blog : How haproxy scales apps). The gear shown running code, for PHP applications, each consists of one Apache HTTPD instance. First, the haproxy cartridge specified 128 as session limit. What if I planned to have 1000 concurrent users ? If the users are using IE, each could create 3 concurrent connection, totaling 3000 connections. So this need to be changed. I read somewhere that haproxy is capable proxying to tens of thousands connections, so I changed the maxconn from 256 and 128 into 25600 and 12800, respectively. The file need to be changed is haproxy/conf/haproxy.cfg in the application primary (front) gear, lines 28 and 53. Normal user is allowed to make this change (rhc ssh first to your gear). [WARNING] 018/142729 (27540) : [/usr/sbin/haproxy.main()] Cannot raise FD limit to 51223. [WARNING] 018/142729 (27540) : [/usr/sbin/haproxy.main()] FD limit (1024) too low for maxconn=25600/maxsock=51223. Please raise 'ulimit-n' to 51223 or more to avoid any trouble. And stop-start your gear after the change. These changes, done properly, will adjust software limits in the openshift node, enabling the openshift node to receive high amount of requests and/or concurrent connections. Of course you still need to design your database queries to be quick and keep track of memory usage. But these software limits if left unchanged might became a bottleneck for your Openshift application performance.